Last week we established that it is not enough to simply learn new skills when you want to excel at interpersonal communication. The reason is quite simple – you have blind spots that you are absolutely unaware exist. You don’t even know the questions to ask to get to the information you need to know. If you are interested in the details click here. This week we are going to introduce a model that will help you understand the two different types of blind spots you have. 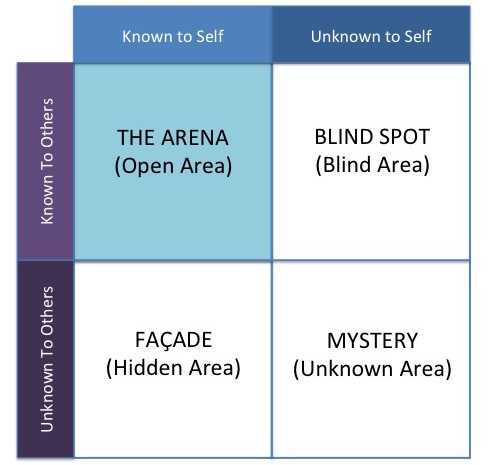 Johari’s Window is a model for understanding interpersonal communication. It was developed out of the tremendous scientific focus on experiential and experimental engagement with interpersonal dynamics that happened on university campuses in the 60’s and 70’s. The fundamental premise is that there are aspects of ourselves that are outside our awareness. These aspects of ourselves that we are not aware of, often cause the very interpersonal problems we seek to remedy. But because they are outside of our awareness we do not have the very data we need to solve the problem. Take a look at the diagram below. In this model there are parts of ourselves that are known to us (Arena & Façade) , parts of ourselves that are known to others (Arena & Blind Spot) and parts of ourselves that are unknown to ourselves or others (Mystery). Some of these areas overlap. For example, there is part of ourselves that we are aware of and that others are aware of (Arena). But there is also a part of ourselves that we keep to ourselves – theFaçade – or rather what we keep behind that façade. The Façade is context dependent. For example, there are many things we share with those who are our intimate partners that we do not share with our coworkers, so depending on who we are talking to that part of us can either be in the Façade or the Arena. But there is also a part of us that we are not aware of that others are aware of (Blind Spot). For example, if I assembled all of my clients and asked them to talk about me – there would be things that I would be surprised to learn about myself. Finally, there is a part of yourself that is unknown to both yourself and the people you interact with. This requires self-discovery both personally and with the help of others. I guarantee you that the parts of yourself you do not know about are affecting your interpersonal effectiveness. Here is the punchline: if you want to be a powerful, effective communicator you must implement processes to bring your Blind spot and Mystery areas into your awareness on a regular basis. Without a concerted and systematic approach to increasing your awareness of the parts of yourself that you do not know about (Blind spot and Mystery) you simply don’t have the data you need to effectively up your level of communication. Unfortunately, this is easier said than done. Most of the data that you need to be better at your communications is not going to be good news. Let me give you an example. I often work with CEO’s and entrepreneurs who have been very successful in their lives by employing a strategy I call tongue in cheek – turning anxiety into success. This strategy entails almost obsessive analysis of the possible different outcomes of very complex problems. By thinking through different scenarios over and over again they are prepared to deal with whatever problem emerges. This is an awesome business strategy at the C level – the problem comes when it is applied to interpersonal relationships. While it makes perfect sense to the client – the impact of being viewed as a problem to be solved on the person they are “solving” sometimes escapes them. Naturally this is very confusing. These are incredibly smart, motivated, and successful people – but just pointing this out to them rarely effects change. The reason is they LOVE the strategy – they have accumulated 100’s of millions of dollars using it. It requires them having an experience of the problem on a very personal level. Unfortunately, these very people often feel a deep sense of loneliness that is confusing to them. The transformation comes in connecting the loneliness with the strategy. Then they are empowered to choose how to both feel close to people and develop the most effective business strategy. Now for a second imagine walking into your CEO, CTO, CMO, COO’s office and saying “You know Fred. I really like working with you and I have learned a lot. But you treat me like an object, a thing to be solved and that is incredibly frustrating.” How is that going to go over? I have a hypothesis that you will have a lot of free time on your hands soon. Often work places are not set up to handle this deep level of transformation. It requires a different kind of environment. One of Stanford Business School’s consistently highest rated classes is what is affectionately called the “touchy-feeling” class. It is a twelve week class designed to do exactly this: bring awareness to those parts of ourselves that are outside of our awareness. How? Self-inquiry and feedback in an intimate, fearless setting. Ask anyone who has gone through it and they will most likely say it was one of the more difficult yet rewarding activities they participated in. A structured setting with the purpose of digging into those strategies that are designed for success but limit us in certain ways.